The talk of the 2018 new iPad Pro has been running at full force, with the 12.9 inch model being only 1.39 pounds. It overshadows iPad Air and earlier iPad Pro models, featuring full-screen design, Liquid Retina display, USB-C charger, Face ID, new processor and iOS 12. with more expensive price than 11-inch iPad Pro, starting at $999. One thing that remains the same is video formats supported by the new iPad Pro are still limited, which means that the new tablet will be involved into compatibility issues when playing some videos and movies. 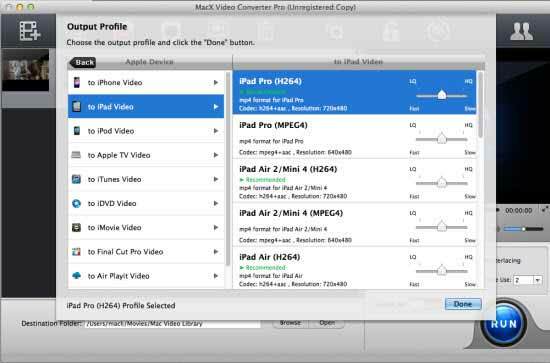 Check out the video and audio formats list below and learn to convert video to iPad without running into format issue. Supported Video Formats: H.264 video up to 4K, 30 frames per second, High Profile level 4.2 with AAC-LC audio up to 160 Kbps, 48kHz, stereo audio or Dolby Audio up to 1008 Kbps, 48kHz, stereo or multichannel audio, in .m4v, .mp4, and .mov file formats; MPEG-4 video up to 2.5 Mbps, 640 by 480 pixels, 30 frames per second, Simple Profile with AAC-LC audio up to 160 Kbps per channel, 48kHz, stereo audio or Dolby Audio up to 1008 Kbps, 48kHz, stereo or multichannel audio, in .m4v, .mp4, and .mov file formats; Motion JPEG (M-JPEG) up to 35 Mbps, 1280 by 720 pixels, 30 frames per second, audio in ulaw, PCM stereo audio in .avi file format. Supported audio formats: AAC (8 to 320 Kbps), Protected AAC (from iTunes Store), HE-AAC, MP3 (8 to 320 Kbps), MP3 VBR, Dolby Digital (AC-3), Dolby Digital Plus (E-AC-3), Audible (formats 2, 3, 4, Audible Enhanced Audio, AAX, and AAX+), Apple Lossless, AIFF, and WAV. Note: 2018 new iPad can record videos in HEVC/H.265 format. 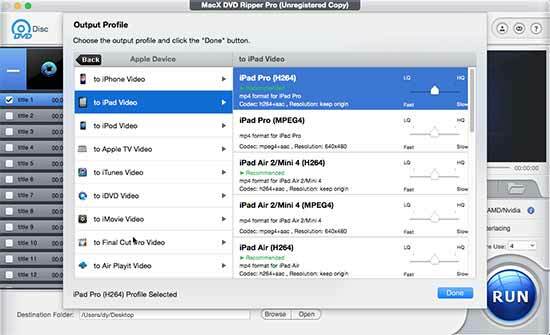 MacX Video Converter Pro allows you to convert videos in MKV, WMV, FLV, MTS, and more to the new iPad Pro supported video formats, like MP4, M4V, MOV with up to 5× faster speed than others and lossing nary a video quality, bringing you the possibility to watch any 3D Blu Ray, 8K 4K movie video on iPad Pro without being troubled by video compatibility problems. Plus, it is able to download any video to the new iPad from over 300 sites, say YouTube, Vevo, Vimeo, Dailymotion, Facebook, you name it. Surely, you can rely on the video converter to download online video/movie/music without a glitch. Step 1: Free download the video converter and run it, click "Add Files" button to load the video file that you are going to convert. Step 2: Choose MP4, M4V, MOV as an output format. Step 3: Click the "Browse" button to choose the path where you want to save the output files in. Step 4: Click "RUN" button to start converting video to iPad Pro. Tick the Hard Acceleration (QSV), and the video to iPad Pro conversion task will go into action with up to 250X faster speed, thanks to the Intel Quick Sync Video tech support. How about watching DVD movies like Inside Out, Big Hero 6, Ant-Man, Jurassic World, Transformer 4 and many more on iPad Pro/mini 4? Yes, it's possible to play DVD movies on iPad anytime and anywhere. All you need is a powerful enough DVD ripper, MacX DVD Ripper Pro. It converts any protected DVD movies seamlessly to digital video formats iPad Pro supports, regardless of any copy protection technology, be it region code, CSS, Sony ARccOS, Disney DRM X-project etc. You are free to convert DVD to iPad Air/Mini, iPhone, Apple TV, and other Apple or Android devices as well.